APQC’s Benchmarking Portal, a members-only resource, puts critical performance data at your fingertips. In one location, you can view the benchmark data you need right now, or submit data about your organization into one of our performance assessments to receive a report that compares your organization’s performance to top, median, and bottom performers. Our database contains thousands of performance metrics to choose from, along with several peer group options. APQC’s Benchmarking Portal leverages the largest open standard database of benchmark and performance metric data in the world, the APQC Open Standards Benchmarking database. APQC’s team of analysts constantly validates every piece of data we receive to ensure logical and statistical validity. We also offer custom benchmarking solutions based on the open standards benchmarking database. We can create a customized experience for you. Please complete this short form and include a description of what you’re looking to accomplish in the comments box.. The data you want. Right now. Get immediate access to the benchmarks of your choice. Select one or more metrics, apply peer group cuts to filter the data set to your liking, and view instant results from our database without having to provide any of your organization’s data. High-level assessments to see how you compare in key functional areas. If you’d like to see how your organization’s high-level functional performance compares with your peers’, choose one of our Rapid Performance Assessments. More than 20 assessments are available across finance, human capital management, and supply chain and focus on the most valuable data within the function including costs, FTEs, and practices. Answer a few questions (about 15 on average), complete a brief validation exercise, and receive a report identifying your organization’s performance relative to the top, median, and bottom performer for the function, all within about two business days. Detailed assessments to find out how you compare at the process level. If you’ve identified a particular process that needs attention and want to know the extent of that process’s performance gap, complete an Open Standards Benchmarking Assessment. APQC analysts validate each submission following logical and statistical guidelines to ensure that only the most accurate data are included in the database. The resulting report identifies the top, median, and bottom performers for each measure across five categories of measures, including cost, cycle time, efficiency, and effectiveness. The resulting intelligence helps you decide where to focus your resources for long-term sustainable improvement. Reports are typically provided within two weeks after survey completion. * The Benchmark on Demand tool is not available to Professional Service/Consulting firm members. For access to benchmarks and data, please contact Cathy Hill at chill@apqc.org or +1-713-685-4652. 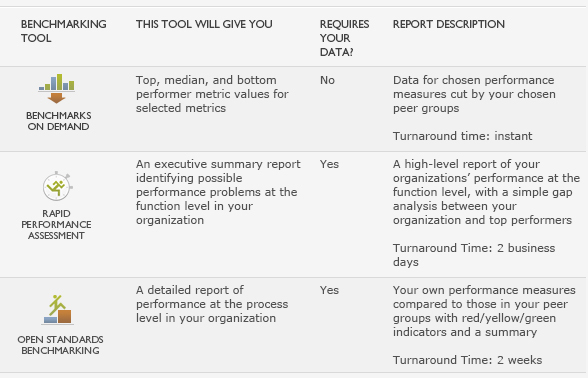 The data provided by the Benchmark on Demand tool is intended to support the understanding, assessment, measurement, and change of internal processes within your organization. You may only use the data on an individual, limited, non‐commercial, and personal basis. Any sharing of this data outside of your organization is prohibited and will be in violation of these terms. If you plan on using the data for anything other than internal process management and improvement, please contact Cathy Hill for licensing options.